Hello. Have we all recovered from our food comas yet? I hope everyone had a wonderful Thanksgiving. It’s tough being back to work after four lovely days off, but such, I suppose, is life. At least there is always the promise of Wednesday and new comics. Oh, issue #2—you were everything for which I’d hoped. Princess Adrienne’s story is continued, but this time around the narrative voice is shifted in the beginning from being Adrienne’s to that of her brother, Prince Devin. 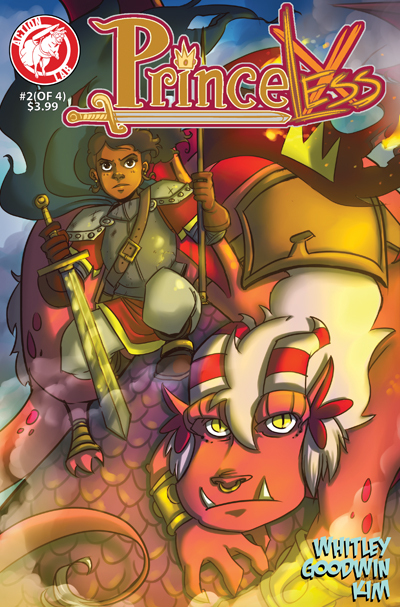 When their belligerent father, the King, is misinformed that Princess Adrienne is dead (having fled the tower atop her dragon at the end of the last issue), Devin is devastated by what’s happened to his sister and the thought that he may have had a hand in her death. Ooohhh, yeah—weren’t expecting that, were you? You’ll just have to read the issue to learn what I mean. There’s a lot more that happens here, but I can’t tell you about it without an insane amount of gushing. Jeremy Whitley’s writing keeps its momentum from issue one, and the hilarity doesn’t stop either. A couple of scenes in particular had me laughing out loud as I read this on one of my train commutes, and the ending left me disappointed in the sense that I was sad there had to be one at all. Two issues in, and I feel like I’ve known these characters for a while. They’re well-developed, well-rounded, and well-illustrated. Wonderful, wonderful comics being made. This book is just a blast, and I’m so happy I found it. In a week where DC didn’t release any of their New 52, it’s a perfect opportunity to check out something else and breathe a breath of fresh air instead of the same old constant disappointment. Please read this book, and please pass it along. I absolutely cannot fathom that you’d regret it. Hmm. What can I say about this one? I’m kind of stupid about Bucky and Natasha. They’ve only been a relatively recent discovery for me and I really, really love the pair … my reasons are myriad. So whenever I see the promise of some Bucky and Natasha team-up, I’m all on it. But this was a little bit of a letdown. The issue started off very well. 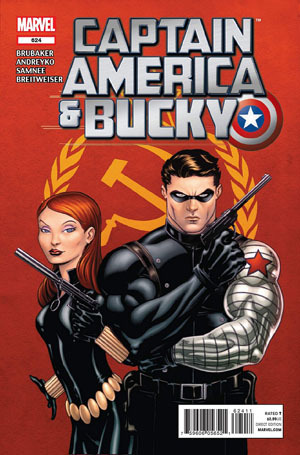 The story is set in the early days of the Winter Soldier, and Brubaker and Andreyko use it to delve into some of Bucky’s past conditioning. We get peaks of his early missions and the formation of his romance with Black Widow, and all is well. We also see Bucky begin to defy his programming—the writing is strong, and I have to shout out to Chris Samnee, who really draws some excellent stuff. His style is wonderfully suited to the “throw back” feel of the book, giving it a unique flavor that’s separate from that of the main Captain America title. I began this by telling you that the issue was a letdown. Then I told you the writing is good and the art is great, so obviously I’m not making much sense here, right? I guess I can’t quite put my finger on what’s missing. I think the problem is that I’m sitting here reading this issue, things are moving, I’m getting really into what’s happening, and then … it’s over. It just sort of … ends, and not in a “to be continued next issue” way. At first I wondered if my copy was missing some pages or something—that’s how confused I was. I even went online and read some web reviews, but the three reviews I read all loved the issue and said nothing much further. I’m thinking I’m the only one who was left with this hanging feeling. If the book were an electronic device, could we chalk this up to “user error”? Did I somehow read the book wrong? Despite my confusion, I can tell you that I thoroughly enjoyed what I read, and if you’re a Bucky fan or a Black Widow fan, it’s worth the pickup. Past that, I’m still trying to figure it out, but if the writing here is any indication of Brubaker’s new upcoming Winter Soldier title, I’ll definitely be picking that up. I had some qualms about this title and the team split that resulted from Schism, but since the X-Men are essentially what got me into comics in the first place, I always tend to follow at least one or two of their books. I read through the Schism event, and while I wasn’t impressed with it to start, the latter issues picked up the pace and I found myself a little more invested in the central argument of what was happening—should the X-kids be mutantkind’s soldiers, per Cyclops, or should they be children and students, per Wolverine? You can see the pull for both sides, and the depiction of that gray area is what makes this so interesting. 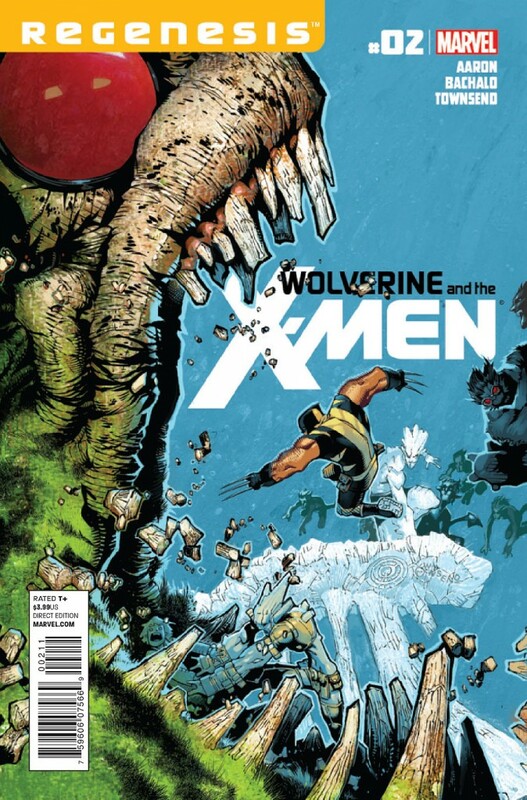 So as much as I dislike the title of this and the emphasis that’s continually placed on Wolverine, the lure of most of my favorite characters siding with him as well as the promise of Chris Bachalo’s artwork convinced me to pick it up. I’m not disappointed. The first issue was a lot of fun, centering on Wolverine and Kitty trying to prep the newly-built Jean Grey School for opening day—and Jason Aaron’s writing was strong. It continues to be so with issue #2, which is full of action. Usually when an issue of a comic is nonstop action, I actually get kind of bored, because my favorite thing about comics is character interaction. I like dialogue, I like getting in characters’ heads, I like seeing them play off of one another. You know when Bendis writes pages and pages of Avengers where the characters are just talking and talking and talking? A lot of people seem to hate that, but I love the stuff. It’s vastly more interesting to me than watching the X-Men battle a giant monster for 24 pages straight. If they aren’t saying things to one another—if I’m not learning anything about anyone by watching them fight, then for me, that “action” is boring. Lucky enough, this seems to be where Jason Aaron shines. The majority, if not the entirety, of issue two was the X-Men in a fight, and I was not disinterested once. Aaron seems to have struck the perfect balance between action and character development. We have an opening scene where Iceman unleashes his oft-discussed “potential” against the bad guys; there are shots of the X-kids holding their own while conversation and even romance brews. There are great things here. That said, it’s definitely not my perfect book. For one thing, I really dislike the villains—not in the “oh man, these guys are so evil” kind of way, but more in the “wow, these guys are so lame” kind of way. A group of rich, genius evil children taking over the Hellfire Club doesn’t do it for me. I just have trouble buying it, and that’s all on Aaron. His setup for them in Schism felt hackneyed and contrived, and I have no feelings invested in the group whatsoever. I can’t connect, and really at this point, I just want the X-Men to defeat them and get it over with so they can move on to their next set of villains. In my last review of the Captain America, I complained that Steve McNiven was the artist on the book for only six issues. Well, Bachalo’s got him beat, because he’ll be off of this after issue #3, with Nick Bradshaw taking over. I cannot tell you how much this pains/saddens/infuriates me, and it’s taking a high degree of restraint not to fill this paragraph with cuss words. While it isn’t a HUGE surprise that Bachalo’s tenure here is brief—I can’t remember the last time he actually stayed on a book past a few issues—it’s still a huge tease to be reeled in like this, only to have half the creative team change within three issues. This is NOT the way to launch a new title, Marvel, and the habit is becoming unbearable. And for goodness’ sake, this book is four bucks. FOUR BUCKS! Argh! Infuriating. Depending on how Bradshaw’s art is, this title may or may not be on a short leash for me. Let’s give it a few more and then re-evaluate. This entry was posted on 12/02/2011 by ravenhaired. It was filed under Awesomeness, Comic books, Female Characters / Creators, Reviews and was tagged with Action Lab Entertainment, Black Widow, Captain America, Chris Bachalo, Jason Aaron, Jeremy Whitley, Marvel, Princeless, Winter Soldier, Wolverine, X-Men. Just FYI in case you couldn’t find it, it split-shipped so some shops got it this week instead of last.